An aging tower sits in the middle of a field in Transylvania. Near the little town of Szalard located in Transylvania, my home for the last two weeks, is a manmade lake that the locals frequently use for swimming, fishing, and hanging out. My host family and I originally planned on being at the lake on Saturday, but a fast-moving thunderstorm interrupted our plans just as we arrived at the lake on our bikes. So, we headed home in the rain in order to regroup and formulate a new plan to head back to the lake on Sunday. Thankfully, the weather on Sunday was a lot nicer and perfect for swimming, so my host brother, a neighbor, and I headed to the lake for a relaxing afternoon. The lake is about 20 minutes away by bike through open fields and farms, affording us to experience the land and the city’s culture. 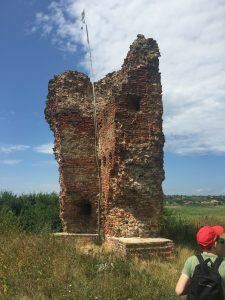 On our way, we took a short detour to see an aging tower in one of the fields. The tower is hundreds of years old and belonged to an old Hungarian King. Beyond the aged tower was a new tower being built at the top of a hill as a lookout point over the whole valley. While not finished yet, we still climbed to the top and looked across the horizon. In the same trip, we also stopped at a fountain bubbling with mineral water. The water tasted a bit like copper, but our neighbor joked that it cured any hangover as he filled his water bottle to the top. A panoramic view of the Transylvanian countryside from the top of a lookout tower. Finally, we arrived at the lake and met up with some of our neighbor’s friends on a dock overlooking the lake. The lake sits at the top of a hill with beautiful panoramic views of the valley. Around the lake are benches and docks with a snack shack run by some of the villagers. 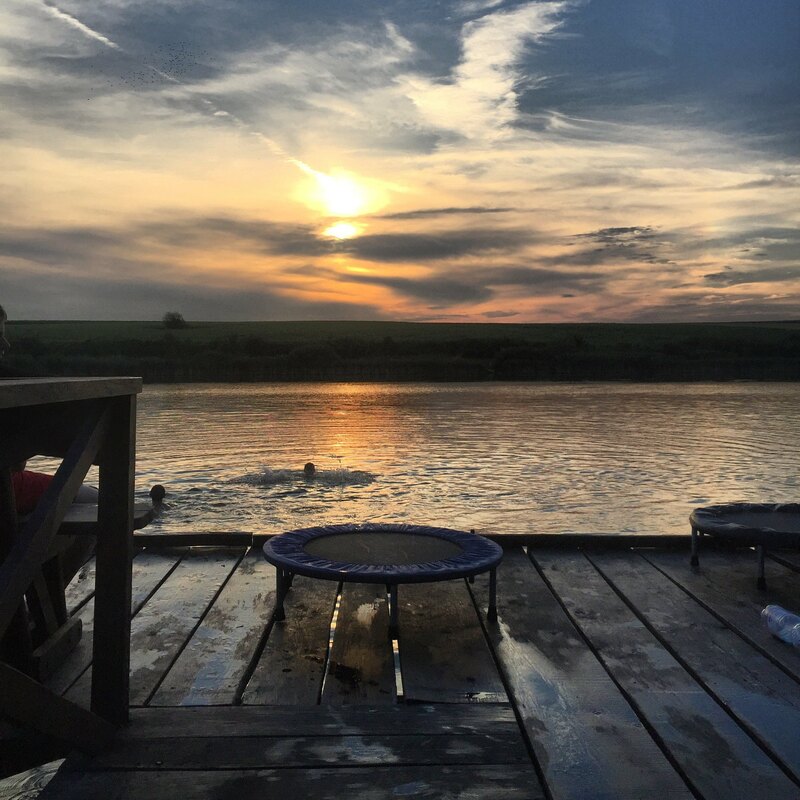 As we sat on one of the docks, American pop music started blaring over someone’s speaker, and we moved a mini-trampoline to the edge of the dock. Soon enough, everyone was doing flips and dives into the water off the trampoline. As the sun began to set around 9:00 p.m., someone passed around a bottle of wine to share as we enjoyed the view.